In January and February 2004, about two dozen senior people from Bethel and the Delta had pre-lunch brainstorming sessions at the Eddie Hoffman Senior Center and Chrissie Shantz Adult Day Center. Those present came up with ideas about the kinds of programs and activities they think are, or would be, useful to themselves and to others over the age of 55. I took notes and Beverley Bell of the EHSC staff or Barbara Liu (contract interpreter) assisted in translation. Any errors are mine. It should be noted that those present were also thinking of the 300 other older people in Bethel. Their consideration was for all people residing in or using Bethel. Every year the City is required by the State to do a survey of those eligible for services, both current recipients and those not participating, in order to improve the program. The Senior Advisory Board must review the survey and add to it where necessary. Other ideas may come from this public process, if the senior program director and City staff would ever allow participation from the elders . Most of the suggestions feature peer-to-peer activities or active senior contributions to others. Unfortunately, many of these ideas have been suggested before (see past 10 years of Senior Advisory Board minutes). The meal and transportation the City supplies are appreciated. But, given the number of times in the last several years the seniors have discussed transferring the programs to a new provider, there is a definite need to improve services. There isn’t a need for a senior center building, per se. [The existing building is dangerous and in need of repairs.] But a place to themselves and to use as a base of operations is valued. Transportation is essential, but a special cab fare for seniors (which could be subsidized by donations or grants) is preferred. The availability of five meals per week is essential. However, meals could be provided by contract, such as through local restaurants or churches or by sharing resources with the other agencies in town who also provide congregate and home-delivered meals. A consistent request is “something to do” in terms of the skills and expertise that seniors have to share with others, but which is not now taken advantage of. Meals-currently, one hot meal during weekdays. Otherwise some people are unable to cook for themselves. Include more native foods. Technical assistance with social security forms, tax returns, other forms is helpful. Qasgim or Kashim and equivalent gathering places for women-to function as advising and learning place for young people and elders. This could be on a drop-in basis, too. Some place and time when those needing feedback or advice or to learn something new could gather. Kids could find someone to ask about parents, growing up. Public notice board-listing events, opportunities, commemorations etc. Experts bureau, organize expertise sharing-for example, UAF courses use elders as class room resources (with an honorarium); researchers need technical assistance or skilled informants and collaborators; engineers or planners need expertise in the community itself; municipal leaders need ideas for financial health, etc. Need information center by seniors in order to direct others to information, someone linking experts, coordinate information; newcomers bureau. Invite people to visit, such as Russian day or Cup’ik day. Invite people from their work, e.g., LKSD, ONC, AVCP, USDA, Hovercraft, YKHC, etc. Then people would know what seniors do. Pre-lunchtime seminars, symposia, brown-bag seminars, guest speakers, similar events. Discussion of current events. For example, people may have children or great grandchildren or nieces in Qatar-why are they there? or be curious about the origins of SARS. Task lights for senior center and at home. 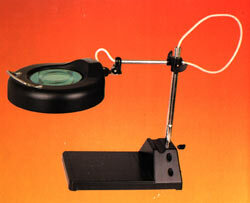 Here’s the illuminated desk magnifier you’ve been looking for, whether you work on malfunctioning mainsprings or counted cross- stitch. The 4-3/4″ dia 4X magnifying lens has a 9″ dia frame that houses a 22-watt circular fluorescent light. It is held above a 7″ x 11-1/2″ all-metal black base with a 7″ x 8″ work area embossed with both standard and metric measurements. The 5 ft cord plugs directly into a 120V wall outlet. Intersecting chrome rods, fittings with thumbscrews, and a 4″ chrome handle on the frame make the magnifier fully adjustable. A very high quality piece. We need furniture which fits the adults in Bethel and isn’t too soft or ill-fitting. Too soft furniture does cause muscle, ligament, and bone injuires as people struggle to get out of the chair or couch. Ideally, we can design our own, we certainly have the skills locally. The Lighting Research Center (LRC) at Rensselaer Polytechnic Institute developed principles for lighting for older adults and tested those principles in two assisted living facilities. The test results demonstrated that lighting helps older adults maintain their independence and improves their quality of life. The AARP Andrus Foundation awarded the LRC a Dissemination Grant to develop these guidelines for designing lighting for older adults. The LRC developed three guidelines that address the needs of 1) the general public, including older adults and their families 2) designers and builders and 3) health care professionals. Our vision is to create a Center of excellence to ensure the independence, safety, and well being of older persons through fall prevention. Our mission is to provide leadership, create new knowledge, and develop sustainable programs for seniors and their families, professionals, program administrators, and policy makers. [ ] Locate steps only where they are necessary and logical. [ ] Avoid small changes of levels, especially single steps. [ ] Use safety glazing for glass that could be impacted in a fall on a stairway. [ ] Arrange for any doors adjacent to steps not to swing over any steps. [ ] Install gates to prevent infant and toddler use. [ ] Avoid sudden changes of views and visual distractions from stairways. [ ] Make steps visually prominent so that their presence is obvious. [ ] Build step riser dimensions no higher than 180 mm or 7 inches. [ ] Build step tread dimensions at least 280 mm or 11 inches front to back. [ ] Keep risers and treads consistent in size (to within 5 mm or 3/16 inch). [ ] Conspicuously mark flights having inconsistently sized steps; e.g. paint a contrasting stripe (25 to 50 mm, 1 to 2 inches wide) on all stepnosings (right at the leading edges of the treads) so that the nonuniformity stands out. [ ] Remove thick (10 mm, 3/8 inch, or more) carpets and underpads on treads. [ ] Fix tread coverings securely; coverings must be tight against the nosings. [ ] Remove/repair tripping surfaces and projecting screws or nails on treads. [ ] Provide slip-resistant (rough) finish on stair treads subject to wetting. [ ] If stairs are subject to wetting, slope treads approximately 1 percent (1/8 inch per foot) to drain water away from nosings. [ ] If nosings project (and they do not need to if treads are 280 mm, 11 inches, deep), keep nosing projections uniform in the flight and configure them so that there is no tripping hazard to persons with poor foot control. [ ] Provide slightly rounded nosings (maximum radius 13 mm, 0.5 inch) for visibility and injury reduction. [ ] Avoid tread materials and coverings with visually distracting patterns. [ ] Mark nosings permanently (not with tape) if they are not distinctly visible. Note that a painted stripe even works very well, and looks good, on carpet. [ ] Provide lighting that makes tread nosings distinctly visible. [ ] Provide lighting that does not cause glare or strong shadows. [ ] Illuminate stairs with no less than two bulbs (especially if incandescent). [ ] Have light levels on stairs at least as high as on adjacent areas. [ ] Unless continuously lit or automatically switched on, provide light switches at each point of stairway access. [ ] Install permanently illuminated, small light sources (e.g., night lights) on stairs. [ ] Provide at least one handrail on each stair regardless of the number of steps. [ ] On wide, monumental stairways provide at least one handrail at the normal path of travel. If used by crowds, space handrails 1525 mm (60 inches) apart. [ ] Continue handrails between stair flights at the shortest path of travel. [ ] Extend the handrail, without a break, the full length of the stair between floors. [ ] Augment any decorative stair railing system with a functional handrail. [ ] Install a handrail around which fingers and thumb can encircle. If you wrap a measuring tape around the railing, the loop should be shorter than 160 mm (6 1/4 inches) for adult hands. A smaller railing is desirable for children. [ ] Maintain adequate hand clearance between the handrail and nearby surfaces. [ ] Position handrails at about adult elbow height, 900-1000 mm or 36-39 inches. [ ] Provide handrails that are visually prominent. [ ] Repair or replace broken handrails. [ ] Fix handrails securely to walls and posts. You should be able to bear your entire weight on the handrail without damaging the handrail. Based on displacement and velocity data of the study participant, one could speculate that rising from the rocking chair was a more difficult task than rising from the standard chair. The lower and more posteriorly slanted seat of the rocking chair and the more forward movement of the knees during the rocking chair condition contributed to greater hip, knee, and ankle flexion (Wheeler et al., 1984; Rodosky et al., 1991). Larger torques at lower extremity joints likely occurred as a result, and more knee extensor muscle activation would be necessary during the extension phase (Wheeler et al., 1984). Using arm supports on rocking chairs would help to decrease joint torques (Bahrami et al., 2000). While greater momentum is generated in the rocking chair, quicker completion of the sit-to-stand transfer does not imply less stress on the joints. While rocking chairs may be comfortable for sitting, they do not provide the best conditions for standing up. For those who lead sedentary lifestyles, the elderly, or those with limited lower extremity range of motion, chair types other than rocking chairs would help to facilitate the sit-to-stand movement. Canadian Centre for Activity and Aging. They have a HOME SUPPORT EXERCISE PROGRAM which various senior centers have modifed for local use.